Why do they do it, the villains? Why do they turn on their own people? I mean, I get it about the blundering. You work hard to come up with an evil plan, and then all the blundering happens. It’s discouraging. But killing your employees after they’ve made a mistake means that’s one less person standing between you and the hero. Yes, you’ve removed someone that you can’t trust from your social circle, but that doesn’t make the rest of them any more trustworthy. Everybody else just starts updating their LinkedIn profiles. It’s still 1897, and apparently I still have to talk about the body switch storyline, which is becoming a real problem in my life. 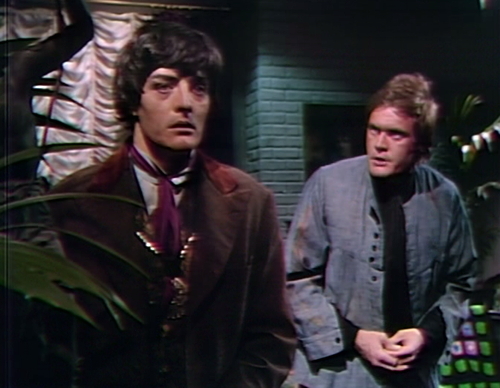 Overall, 1897 is my favorite period of the show, Count Petofi is a fantastic villain, and the body switch storyline is clever and fun, but all of that is easier to say when you don’t have to write blog posts about this particular week. I’m sick of explaining the body switch, I’m sick of 1897, and I just want to go home. And it’s not the body switch, really. I shouldn’t be lashing out at the body switch. The problem is that 1897 is over. The big climax of 1897 is when the mad god Count Petofi manages to use the I Ching to project himself forward to 1969, jumping into Quentin’s body. That’s a really exciting cliffhanger — the villain triumphant, putting a whole new generation of the Collins family at the mercy of the evil wizard. There’s so much narrative joy in that cliffhanger. But that happened last week, on a Tuesday for some reason, and then Petofi was abruptly snatched back to 1897 for another three weeks of uncalled-for denouement. And they’re still working on this insane six-days-a-week schedule that we talked about last week, storing up a backlog of episodes so that they build more of a cushion between taping and the airdate. This is tough on everyone, including the writers, who have to go into overdrive, just at the moment that they should be crafting a satisfying conclusion to 1897, and a thrilling introduction of whatever comes next. Oh, and they also have to write a movie. 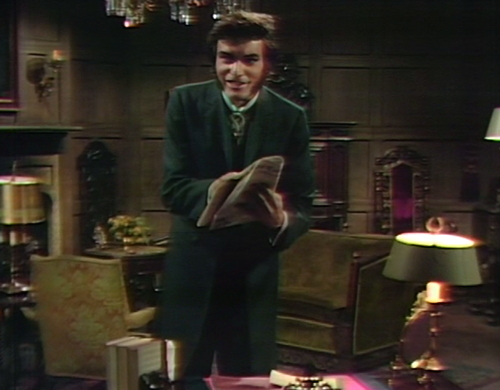 The mad god Dan Curtis, executive producer and certifiable lunatic, has decided that he wants to make a feature film version of Dark Shadows using the same cast and the same writers, while the show is still in daily production. This has never been done before, because it’s a deeply unwise thing to do. It’s a show-killing idea, really, and here we are, watching the show get killed. If this extra work had happened over the summer, it would have been so much easier to deal with — back when Quentin was a werewolf, and Dirk was a vampire, and Magda was hurling gypsy curses. There was so much story back then, and they were just sprinting through plot points like they’d never run out. Remember that? But this is what happens when you push people too far, when the super ambitious daytime spookshow runs out of gas — you get weeks like this. And so, with the 1897 plot points dwindling, we get an entire week focused on Aristede, the wizard’s faithful henchman. This is not an all-star idea. Aristede was very exciting when he was first introduced four months ago, because he was a weird novelty — the polite assassin with his exotic dagger, all dressed up like a gentleman and topped with an Astrakhan hat. We’d never seen anything like him before. As we’ve discussed, there are three steps to getting the audience to care about a new character — make a friend, make a joke, and make a plot point happen. Aristede nailed all three. He was devoted to his mysterious employer, he tied Quentin up under a swinging axe, and he always had a mischievous twinkle in his eye. But those three steps are just the opening act; you can’t coast forever on a good introduction. To survive in the cut-throat environment of a daytime soap opera, a character needs more than one friend. You need to make connections with lots of other characters, because if your only connection goes down, then you’re going to go down with him. Aristede doesn’t have any other friends or connections. He didn’t fall in love with Beth, or join Evan’s cult, or learn Trask’s secrets. He is what he always was — Petofi’s lackey, and nothing more. This week, even Petofi turns on him. Aristede wasn’t around when Quentin and Petofi switched back to their own bodies, and Quentin’s tricked him into stabbing his boss in the chest. Understandably upset, Count Petofi — now fully engaged in third-act Bond villain self-destruction — has decided that Aristede must die, and the rest of us must spend a whole week watching it happen. 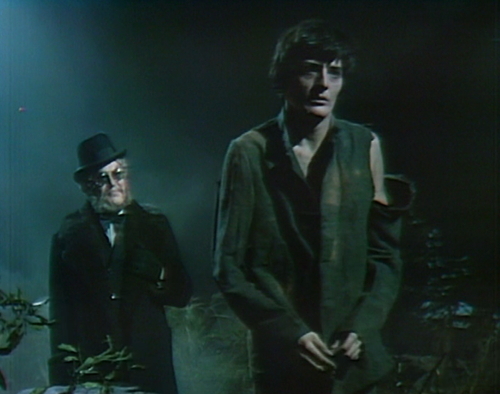 Desperate to win back his master’s esteem, Aristede runs off to Collinwood to kill Quentin, but Petofi is still dreaming of a Quentin-themed future in 1969. 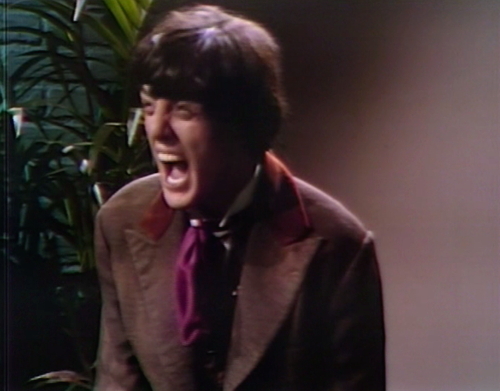 So the mad Count picks a new favorite henchman — sensitive artist and sudden psychopath Charles Delaware Tate — and sends him off to Collinwood to bring Aristede back. Aristede’s got a sword pointed at Quentin’s throat when Tate shows up, wielding a gun and growling at him to hustle back to headquarters. This is another serious blow for Aristede. He’s lost his only friend, he’s stopped making jokes, and now he’s not allowed to make plot decisions anymore. That means we are no longer under any obligation to care about him. Aristede can be dismissed. So the thing that we don’t need right now is a lengthy flashback explaining how Petofi and Aristede met. It turns out Aristede was locked up in Dartmoor prison, and he killed a sadistic prison guard named Garth Blackwood before making his escape. Petofi found Aristede stumbling around in the wilderness, haunted by the memory of the terrifying man that he killed. It’s a nice little slice of backstory, and it sets up a memorable new monster for the closing weeks of the storyline, but this is not the time for new Aristede-related information. The show has already signaled to us that we should lose interest in Aristede. He’s an expendable henchman, a third-tier novelty character who’s worn out his welcome. His biography is of no further use to us. 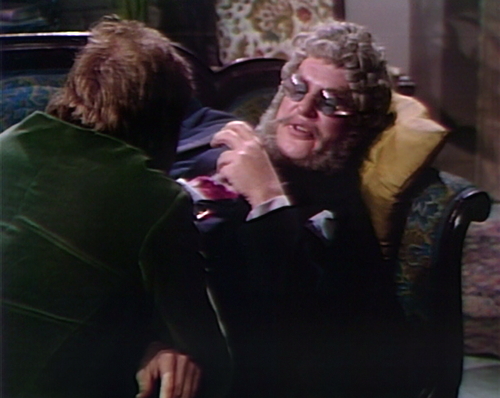 Towards the end of the episode, the wounded Petofi takes a meeting with Tate, who’s been promoted to chief henchman. But he’s not precious, is the problem. He may be precious to Petofi, but he isn’t to us, and now we’re the ones being tormented. Forget the haunting. Just kill the guy, and let’s move on. Tomorrow: Flight of the Conquered. Tate: I don’t consider you an important guest. Tate: You’re not invited, and you’re not welcome! Tate: What are you talking about? Petofi: … and what’s going to happen. Tate: I said, what are you talking about? Then Tate says, “Listen, Petofi, I am in no mood for your nonsense!” It’s odd that he uses Petofi’s name, since the point of that line is that he thinks he’s talking to Quentin. Aristede raises his dagger, preparing to strike Petofi, and then the two of them stand there frozen for an uncomfortable moment before Aristede gets the cue to stab Petofi. 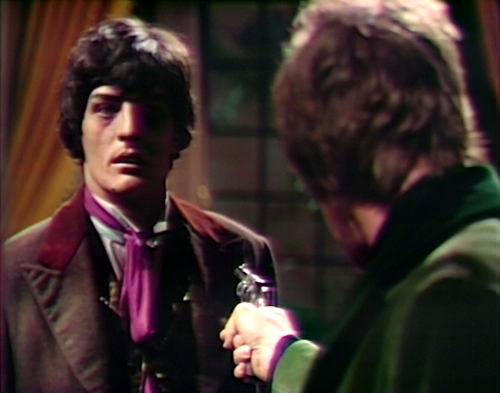 At the beginning of act 1, Tate enters the room holding a bottle. Rushing to Petofi’s side, he sets down the bottle — and the bottle tips over, sending a gush of liquid onto the floor. The colorful afghan shows up again today in Tate’s studio. 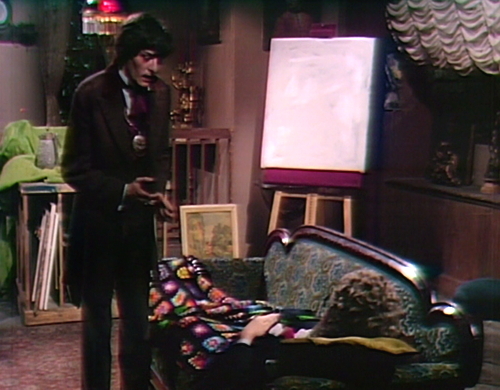 It’s an unlikely bit of set dressing for an artist, but every character on the show seems to love this afghan. We saw it two weeks ago on Pansy’s bed. “Precious” also has the meaning of “excessively refined, affected,” which could also describe Aristede. The word doesn’t necessarily imply a valued personal relationship. Even when Aristede disappeared from the story, it made sense that he had run away out of cowardice. I feel like he deserves this backstory, (although I wish it had come earlier) and I found this episode of Petofi’s tossing away this Gutman/Wilmer like relationship away the most moving part of the finale and the most affecting out of the whole run of deaths that are going to happen this week. Compare it to the cold stone in my heart when we have to watch the whole Josette tragedy play out yet again. Let’s get through this next week and then naga box it out of ’97. 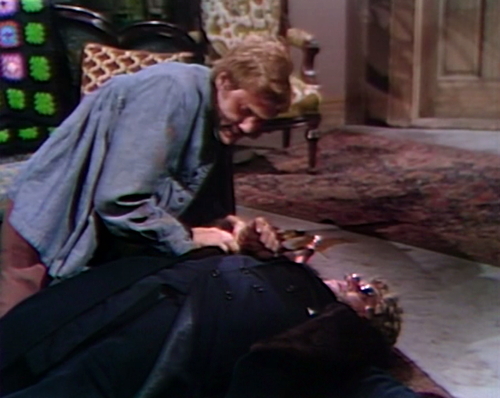 Tragic that Petofi wants to kill his incompetent bungler of a henchman Aristede – even worse, he doesn’t have a large pool full of piranha fish to drop him into – or a giant magnifying glass to put him under. Or a Green Goblin Glider to impale him with. Not even a secondhand Cylon. Just Roger ‘Give Me Back My Talent’ Davis. Yet still Petofi gets the job done with his needlessly convoluted plot. Kudos, Count. So what if the scheme instantly runs amok and tries to execute everyone? One just can’t plan for EVERYTHING!